When we made the leap and moved across the country two years ago, Joe made the comment, "We used to dream in thousands and now we dream in millions." Now, in this current transition our dreams are moving from millions to billions. These numbers - these dreams - are not fantasies or wishes. These dreams are becoming reality. I can taste them, see them, and almost touch them. My fears are being replaced with excitement and hope. 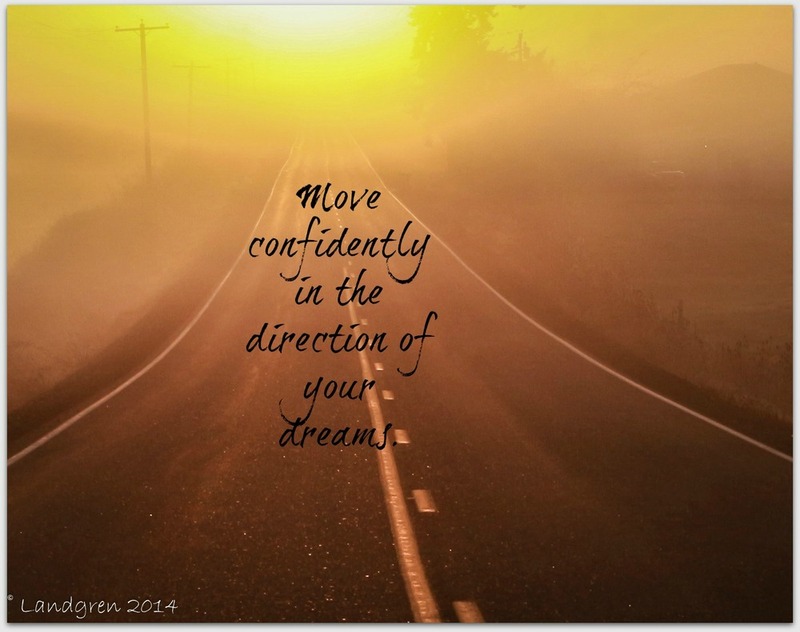 Move confidently in the direction of your dreams. Dreams - and pursuing those dreams - are a vital part of living an extraordinary life. It is not simply the size or kind of dream that makes the life ordinary or extraordinary. It really is the pursuit of a dream. Ultimately it is about who we become and who we have opportunity to impact as a result of pursuing the dream before us. This looks different for each of us. In order to grow, to live extraordinarily, our dreams ought to grow so that we are stretched outside of our comfortable status quo. What grows our dreams? What does it take to increase our ability to dream bigger dreams? If you want to grow your dreams then you must dream. Talk about your dreams. Write and journal about your dreams. Create a dream board filled with photos and words representing your dream. This gives color to and clear pictures of the dreams you are moving toward. Visit your dream. If you dream of owning a Bed & Breakfast, then visit Bed & Breakfasts. Discover what you like and don't like. Take photos. Fill a notebook with ideas and reviews. Interview the owners. There must be a seed of belief and hope in your heart that you can achieve the dream. Water that seed. Surround yourself with others who believe in you and will fuel your passion of pursuing your dream. These friends do not have to have the same dream, but they must believe in you and your ability to achieve your dream. Perfect timing and perfect circumstances are impossible to achieve. I often hear people say, "When we have enough money we will start a family", "When the house is paid off we will take that dream vacation", "When fill in the blank, then we will fill in the blank." The reality is that if we wait for everything to be perfect and aligned, then we will never pursue our dreams. It is more likely that a great opportunity will arise at the least opportune time. What action step do you need to take in order to dream bigger, believe more, and move confidently in the direction of your dreams? The extraordinary life will not likely drop in your lap: you must go after it! **We have big dreams as we launch Overboard Ministries full-time. If you want to learn more, check out this 10 minute video explaining how we’re taking Overboard Ministries, overboard! If you would like to join the Overboard family thru prayer or thru monthly financial support, click the links! Sunrise photo by Bev Landgren.